What are Surgical Tooth Extractions? Figure 1: A non-restorable lower molar tooth with a curved (dilacerated) root is less traumatically removed if the tooth is divided into pieces. Whether or not a surgical access flap is required to do this, the procedure is considered surgical if the tooth is sectioned into pieces. Surgical tooth extractions are tooth removal procedures in which surgical access is required to completely remove a tooth. Even if the tooth is visible in the mouth without surgically exposing it, surgical techniques may be necessary to remove the tooth. This includes sectioning the tooth into two or more pieces, whether or not a soft tissue incision is made. Surgical extraction does not necessarily mean that the dentist removing the tooth has advanced training in oral surgery, and you will generally not be billed for surgical tooth extractions unless the tooth is sectioned into pieces, or an incision into soft tissue is made. Surgical tooth extractions include removal of impacted wisdom teeth (third molars), but this does not mean that all wisdom teeth requiring removal are required to be removed surgically. Figure 2: A soft-tissue impacted lower wisdom tooth (third molar). Removal of this tooth is also less traumatic if the tooth is divided into pieces. Often, impacted teeth require a surgical access flap to be made in order to provide better visibility for the dentist. Removal (extraction) of a tooth is prescribed if the tooth is too extensively damaged from decay (Figure 1) or trauma to be fixable, or if it is infected and the patient is not a candidate for endodontic (root canal) treatment. It is also frequently prescribed when the teeth of one or both dental arches are severely crowded, and straightening the teeth would require unnecessarily complex orthodontics with a potentially compromised treatment outcome. Figure 3: Decay (caries) extended into the roots of this tooth, which made it unrestorable. The prognosis was considered “hopeless.” Removal (extraction) was recommended. Because so little intact tooth structure remained, and the tooth had been endodontically treated (note the white root canal fillings evident inside the roots), the procedure was anticipated to require surgical access. Most commonly, either two or four bicuspid teeth are removed in such cases, and generally they are removed by “simple”, not surgical technique. Sometimes the decision to remove a tooth is based on cost, if the procedures required to restore it would involve significant expense. This is especially true if the prognosis for the tooth (i.e. likelihood of long-term success) is not good. Wisdom tooth removal is frequently recommended, and ideally prescribed in the late teens to early twenties, if it is apparent that these teeth will not fit in the jaws in a normal bite relationship with normal gum tissue contours. Extensively damaged teeth, and teeth with multiple curved roots frequently require extraction by surgical technique when removal is necessary. Teeth which have been endodontically treated and later need to be removed for some reason, frequently require surgical technique as their roots tend to be more brittle. Figure 1: Here a periotome is shown in position in the ligament space on this study skull. Not showing the gums clearly demonstrates the gap that is present between a tooth and the tooth-supporting (alveolar) bone. The periotome is inserted as far into the ligament space as possible, to release the majority of the attachment fibers from the tooth. When you have invasive dental procedures like tooth extractions done, the dentist will review your health history. If you have replacement joints (e.g. total knee, hip, etc. ), you may be pre-medicated with antibiotics for the procedure. If you have certain types of heart murmurs or replacement heart valves, you may also need to take an antibiotic pre-medication prior to the procedure. If you take blood thinning medications or drugs that inhibit platelet aggregation, particularly if you take either with aspirin, your dentist and/or physician may require you to suspend those medications temporarily to have any oral surgical procedures, including simple tooth extraction. This is due to the possibility for prolonged bleeding from tooth extraction sites. The following describes a typical steps involved in surgical tooth extractions. Your procedure may vary from the procedure described. The tooth to be removed is usually anesthetized by injecting local anesthetic around the nerve(s) that supply sensation to the tooth. Discomfort from the injection can be minimized by use of a topical numbing gel for a minute or two prior to the injection. If the tooth is not visible, or is only partly visible in the mouth, it will be necessary to gently expose the tooth by elevating a surgical flap. An incision is made, and the gum tissues are gently reflected to expose the tooth. Teeth are not normally fused to bone. Instead, they have a shock-absorbing ligament that suspends them from the bony tooth socket. The ligament is called the “periodontal ligament”, and the first step in removing a tooth is to release it. This can be done very atraumatically with a thin-bladed instrument called a periotome (Figure 1). It may be necessary to remove enough bone from around the tooth to allow its removal (full- and partial-bony impactions). This is generally done with a surgical handpiece that is specially designed for the removal of bone. To prevent the tooth from being swallowed or inhaled when it is removed, dentists will often place a “safety net” of gauze in the back of the mouth. Whether or not a surgical access flap is required to expose the tooth, it may be necessary to section it into individual pieces to remove it safely and without trauma. That step would usually be accomplished next. How many pieces the tooth is divided into depends on many factors, including the number and shape of the roots, as well as any nearby anatomical features that may be of concern (like nerves). Figure 2: Here an elevator is shown adapted to the back corner of the tooth. Not showing the gums clearly demonstrates that the elevator applies leverage between the tooth and tooth-supporting (alveolar) bone, so as to separate them. The tooth is (or individual pieces are) loosened (luxated) within the socket by applying leverage with an instrument called an elevator. There are several types of elevators, depending on the shape and size of tooth to be removed, and its location in the mouth. The tooth’s bony housing is somewhat pliable, like a green tree branch, and elevation enlarges the tooth socket enough to remove the tooth (Figure 2). When the tooth has been sectioned, the socket generally isn’t enlarged much, if any. 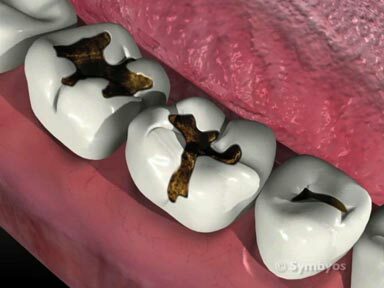 The tooth fragments are removed in an ordered sequence, that usually involves curved roots being removed last. If the tooth being removed is going to be replaced (for example, with a dental implant or fixed bridge), the dentist may recommend placing bone graft material in the tooth socket to significantly decelerate the bone resorption process and preserve the height and width of the bony ridge at its pre-extraction level. If ridge preservation is not done, the height and width of the bony ridge will immediately begin to deteriorate with the healing process. This procedure is not generally done when teeth are being removed as part of an orthodontic treatment plan. Early removal of the horizontally impacted wisdom tooth from this patient could have prevented the large cavity (arrow) that developed in the second molar. Following removal of the wisdom tooth, the patient required root canal treatment and a crown on the second molar. This involved four additional appointments, the discomfort of an infected tooth, and significant expense. Certain teeth may be candidates for immediate replacement with dental implants. If no acute infection is present (i.e. one that has drainage and swelling), and the bony socket is intact, you and your dentist may plan for immediate placement of the dental implant upon removal of the tooth. A bone graft may be required simultaneously. When the tooth is out, the dentist will apply pressure directly to the tooth socket to minimize any bleeding. There are no major arteries in tooth sockets, so bleeding is generally minimal anyway. Your dentist will give you specific post-operative instructions, taking into account your unique medical and dental situation. Oral, written, and/or video instructions are helpful. Although they may seem simple at the time of your appointment, questions frequently come up later.